Avocado And Almonds Milk Shake | Simple and Delicious ! I saw her walking to and fro singing and laughing.. I thought she never listen to anyone around her. Suddenly she came near me, held my hands, pulled my handbag, gave me a hapless look and murmured 'chocolate'.. I couldn't speak since a cactus had already grown wildly in my throat and thought and was trying hard to stop the tears falling down.. But soon she changed to a kitten when the care taker approached her and silently moved to her room..
Its heart breaking to see a girl in this state who should be busy with her studies and activities..
Last week, I visited 'Thanal' in Thrissur with my family. This was my second visit, and found the whole house has been moved to a new building. The three storey building was occupied by about 182 members, all of them are women and children, some of them are handicapped or mentally troubled. One part of the building is still under construction and they need money to continue the works. I hope every readers who read this please try to help them as possible. We were really impressed by the care and attention they give to each members, and that should be continued. May God bless the people who work behind 'Thanal' ! 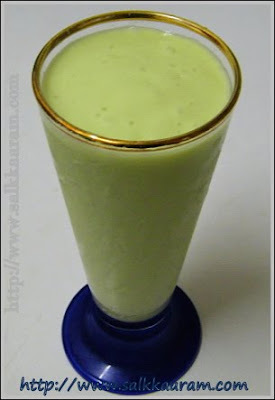 Here is a simple avocado and almonds shake, which I changed the normal avocado shake to a mixture of almonds and avocado.. I have two reasons for this, one is my kids don't like almond milk shake but love avocado and I don't like avocado but love almonds shake very much...So adding both together changed the taste and brought a new kind of drink.. :) So try out and let me know, and don’t forget about 'Thanal' .. Collect the pulp of avocado. This may serves for 4 persons. Adjust the thickness by adding more milk. Thanks for redirecting us to the link. I am so touched. May God reward those who are behind such a meaningful project. Thanal does fabulous work seens..totally heartfelt..
so,clever mom incorporated both avocado and almond to make them smile ? Love the color, looks refreshing! wow, this is such a neat idea.. have to try this. Healthy drink. Might be perfect for a breakfast!Looks like a smoothie. That looks healthy and colorful! Wow.. this looks yummm and healthy. :) I am sure I would like it loads. Hi Seena, I am very happy to find your site. I surfed for chilly beef and I got into your site. It came out nicely. I tried your Avacado and almonds milk shake. It came out well. Thanks for your recipies.